Nick Jonas celebrates his nomination for best original song at the Golden Globes releasing the music video for the track “Home”. 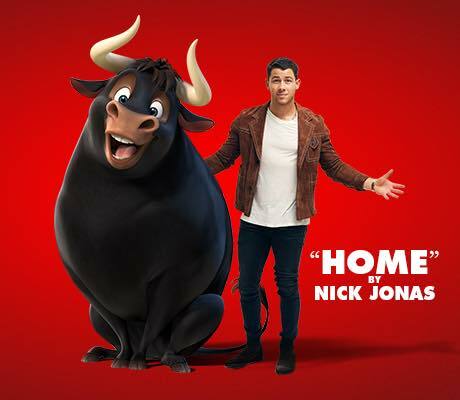 Written by Nick himself with Justin Tranter and Nick Monson, the feel-good single appears on the soundtrack for American 3D computer-animated comedy “Ferdinand”. The Carlos Saldanha-directed film is inspired by “The story of Ferdinand”, a children book, and starring the voices of John Cena, Kate McKinnon, Gina Rodriguez, Anthony Anderson, Daveed Diggs and many others. It tells the story of a big-hearted bull, who mistaken for a dangerous beast, is captured and torn from his home. The music video for “Home” sees Jonas sings the song from the center of the arena for most of the clip before being joined by a group of people who come from “all different walks of life” and ages, including a couple of flourishing flamenco dancers, and they all dance together in the final measures of the track. The video also features clips from the new film. “Ferdinand” hits theaters on December 15.